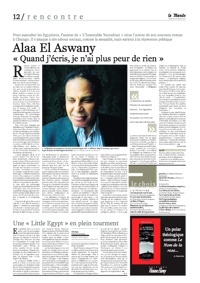 Readers may be interested in reading this profile of Egyptian novelist Alaa al-Aswani from last week's Le Mondes des Livres, accompanied by a review of the recently launched French edition of his last novel, Chicago. We had mentioned Chicago when it came out earlier this year, while Baheyya had reviewed it. Update: More al-Aswani goodness over at Fustat.